Boeing Co.’s $600 billion-plus order book for its 737 Max began shaking after several big customers threatened to reconsider their purchases in the wake of the Ethiopian Airlines crash, the second deadly accident involving the plane since October. That’s as Indonesia’s Lion Air firms up moves to drop a $22 billion order for the 737 in favor of the Airbus jet, according to a person with knowledge of the plan. Separately, a $5.9 billion order from a unit of Saudi Arabian Airlines hangs in the balance. Boeing, whose shares have lost 11 percent of their value this week, faces escalating financial risk after two disasters involving its newest narrow-body jet in the past five months. The stock inched up 0.5 percent on Wednesday in New York after seeing its biggest two-day drop in almost a decade. The deadly crash in Ethiopia comes just about five months after the Oct. 29 crash of another Boeing 737 Max plane, operated by Indonesia’s Lion Air. The relationship between the carrier and Boeing soured after the manufacturer pointed to maintenance issues and human error at Lion as the underlying cause, even though the planes pilots had been battling a computerized system that took control following a sensor malfunction. 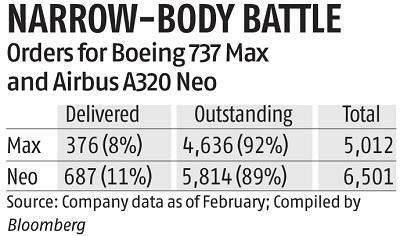 Indeed, the only real rival to Boeing is European planemaker Airbus, whose production line for the A320neo is full well into the next decade. Alaska Air Group Inc. said Wednesday it would take delivery of its first Max aircraft. VietJet is monitoring the situation and will reach a decision on whether to go ahead with its purchase following “official conclusions” from global regulators and the Civil Aviation Authority of Vietnam, it said in a statement Wednesday. Kenya Airways will consider switching to Airbus or could opt to take more an the older version of the 737 Boeing jet, which doesn’t feature the suspect system, Chairman Michael Joseph said in an email, without ruling out sticking with the Max. The company revived plans to expand its network last year with a proposal to buy as many as 10 of the planes worth about $1.2 billion. “We will carefully follow the developments around the 737 Max,” Kenya Airways’ Joseph said. “No decision has been taken yet.” Sub-Saharan Africa’s third largest carrier is almost 50 percent state-owned after a reorganization in 2017.